"I did not resign. Moments ago I was fired," Bharara tweeted Saturday using his recently created personal account. "Being the U.S. Attorney in SDNY will forever be the greatest honor of my professional life." The Southern District of New York, the prominent post to which Obama appointed Bharara in 2009, includes the Manhattan and Bronx boroughs as well as neighboring areas just north of the city. Bharara began working there in the thick of the mortgage crisis, and rose to prominence after overseeing a number of insider trading and public corruption cases. Time magazine famously lauded the prosecutor on its cover as the man who is "busting Wall Street." 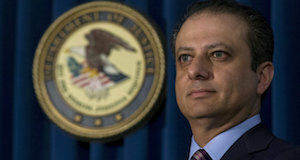 Last year he announced charges against 120 people from rival New York street gangs who were snared in an operation Bharara had said was "believed to be the largest gang takedown in New York City history." Presidents often order political appointees from the previous administration to resign when they take office, but the abrupt nature of the move caught some by surprise -- especially given that so many were asked to leave at one time. Trump's request that Bharara leave came as a particular jolt because the attorney had met with the U.S. president shortly after his November election at Manhattan's Trump Tower. He told journalists then that Trump asked him to stay on. "The president-elect asked," the New York attorney had said at the time. "Presumably because he's a New Yorker and is aware of the great work that our office has done over the past seven years," he said, adding that he had agreed to stay on. Several New York elected officials -- among them Republicans -- had jumped to Bharara's defense following the White House demand that he step down, praising him for refusing to do so. "Good for Preet, he is doing the job he was appointed to do!" the New York State Assembly minority leader Brian Kolb wrote on Twitter. Republican Assemblyman Steven McLaughlin tweeted that the White House request was a "big mistake," urging Trump to "#KeepPreetInTheSeat." When he was asked to step down Bharara had been overseeing probes into associates of New York's governor Andrew Cuomo, a Democrat, as well as the administration of the city's Democratic mayor, Bill de Blasio. Justice Department spokeswoman Sarah Isgur Flores had said Attorney General Jeff Sessions asked "all remaining 46 presidentially appointed U.S. Attorneys to tender their resignations in order to ensure a uniform transition." Later Friday, another Justice Department spokesman, Peter Carr, said Trump had asked two to stay on -- current acting deputy attorney general Dana Boente and the man he picked to take over that position, Rod Rosenstein. Senate Democratic leader Chuck Schumer, also of New York, had said he was "troubled" to learn of the mass request for resignations, especially that of Bharara, and said it had not been done in an "orderly fashion" as seen in the past.